The AF-S Teleconverter TC-17E II allows focal length to be extended by a factor of 1.7 times while retaining a sense of overall comfort in the hand. 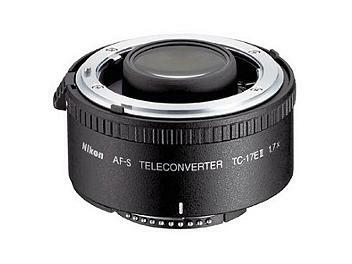 Many such teleconverters can also have a detrimental effect on the speed of the lens, however the AF-S Teleconverter TC-17E II makes available f-stops only 1.5 stops slower. (*)Note: Only limited AF with AF-S 500mm f/4D ED-IF (II) and AF-S 600mm f/4D ED-IF (II). Autofocusing only possible when used with D1, D1X, D1H, D2H, D100, F5, F100, N90s, N80, N75 and N65 AF SLR Cameras (or any newer models).